Along the DCR Cambridge Parkway today, the Museum of Science and its sponsors held the “Let’s Talk About Food” festival. I didn’t go last year. I had never even heard of it until about two weeks ago when I saw an ad banner for it inside a Red Line subway car. We all eat. Rich or poor. Several times a day –– if we can. Food is the central feature of human society. Food forms the basis of our cultural traditions, creates community, optimizes or sabotages our health, affects our environment, provides livelihoods, impacts our global economy, and nourishes the next generation. Food has become a major focus in our society. And what we’ve learned is: People want to talk about it. They want to know. They want to learn. And they like to eat. Launched in Boston 2010, in dynamic partnership with the Museum of Science, Let’s Talk About Food Initiative hopes to become a national, educational, event driven, organization that creates programs to increase the level of public literacy about all aspects of our food system – from sustainability, to cooking, to obesity and other food-related health issues, to fishing and farming, food access, food justice, food safety, environmental concerns, agriculture and nutrition policy, and at the same time celebrates the richness that good food brings to our world. I went with my sister and my mom. 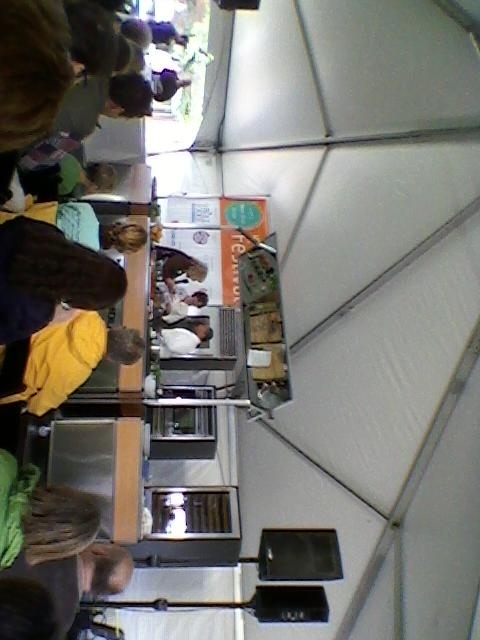 After some discussion, we decided that we wanted to be there by 10:40a for the main stage demo called “In the Spotlight: Cooking with Honey” which was led by Chef Charles Draghi (Erbaulce) and Christy Hemenway (Gold Star Honeybees). Due to our bus schedule, we ended up at the festival at about 10:15a. Even though it technically opened at 10am, an early morning storm seemed to slow everyone down. We probably should have hit up more vendor booths at that time, most of them were set up, but it was so muddy that we just headed over to the main stage tent. Over there, we spent some time at the Whole Foods tent sampling a biscotti-looking snack made from dates, raisins, and other wholesome goodness. The Whole Foods tent was also giving out organic apples and re-useable Whole Foods backpack (it’s the kind of tote where you pull the cords to close it and then slip your arms through to cords to wear as a backpack). During “Cooking with Honey,” we were shown a couple of ways to work raw honey into recipes. The first recipe was a Parmesan snack. First, you grate some Parmesan rind and fry it in a pan until it cooks into a wafer (and flip to quickly cook the other side). Then, you top the wafer with fresh apples or fresh pears (feel free to spice up the fruit with nutmeg or anything you’re in the mood for). Finally, spoon some raw honey on top to finish, and serve. Chef Draghi said that this snack would pair well with a nice rosé. The second recipe given (but not demonstrated) was a summer drink: 2T raw honey and 1 tsp lemon juice mixed into 16 oz fizzy water, served with mint leaves muddled/crushed. I got to sample the Parmesan wafer. It was good but I’m not a huge cheese lover so I found the parm flavor to be a little too strong. Also, noticed that I was allergic to the raw honey since I do not consuming it regularly enough to build up a tolerance to the pollen inside it. Next to take the stage was Chef Jody Adams of Rialto! She and Governor Deval Patrick showed us a way to serve lobster (which smelled divine even from the audience seats… trust me). They were a lot of fun to watch – friendly interactions and humor. Here’s a photo of Jody Adams after putting a Rialto chef’s jacket onto Deval Patrick. Sorry it’s a crappy photo. I forgot to grab a camera on my way out so this is picture was taken with a phone.